Why Are ERP Implementations Faster with KenandyTM? 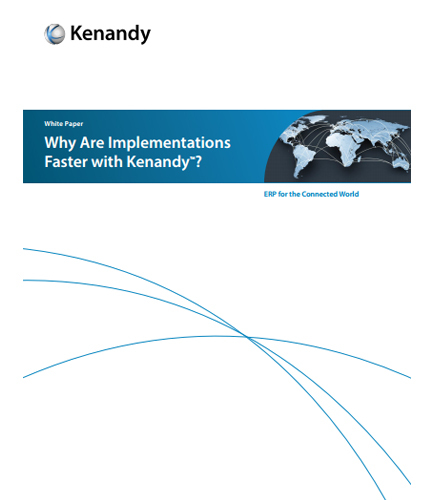 "Why Are ERP Implementations Faster with KenandyTM?" Why Are Implementations Faster with KenandyTM? For ERP implementation- whether it’s on-premise or on the cloud, you must address some key functional considerations to ensure a fast and successful deployment. Implementation of an ERP system is not straightforward, but remembering some of these simple suggestions will help your project have a greater chance of success than ignoring them. So, what happens if your business is highly innovative and you want to leverage your own best practices? What is Quantum annealing and how can it revolutionize your field service organization? Implementing Quantum Annealing technology has enhanced the speed of field service businesses. It is critical to control costs, manage cyclical demand, ensure consistent delivery of services and improve customer satisfaction through an age old scheduling technology. Increased use of mobile workforce management software has increased the need for schedule optimization, as it is simple and less efficient for field service businesses. Field service business have been using age old schedule optimization techniques based on an artificial intelligence algorithm called Simulated Annealing, to optimize work schedule. ServicePower, a veteran Mobile Workforce Management provider, has come up with the new optimization algorithm called Quantum Annealing (QA). This white-paper looks into incorporation of new Quantum Annealing algorithms into the latest schedule optimization solutions to improve field service businesses. Why Quantum Annealing over Simulated Annealing? What are the different scheduling approaches implemented through Quantum annealing? What is intelligent scheduling? How does service scheduling use simulated annealing? What are the advantages of Quantum Annealing? Download this whitepaper to know more and understand the improvements of Quantum annealing over simulated annealing.